PGSM. Pet. 亀吉 (かめきち) Kamekichi is the pet of Motoki who works at the Karaoke Parlor. Kamekichi is a green, male turtle. His name means "Lucky Turtle" and is a common name in Japan for turtle related things. Kamekichi most often appears in Crown Karaoke. Once Motoki even talked about Kamekichi's girlfriend, Marilyn. Usagi sometimes refers to Kamekichi as "Kame-san." PGSM. Actress. 河辺千恵子 (かわべ ちえこ) The actress who played Oosaka Naru in the live action. She was born on February 24, 1987 in Tokyo, Japan. She also played Sailormercury in several of the SeraMyu (Sailormoon Musicals). She has appeared in the TV Drama Koi Suru Ichigo Paradise ("Strawberry Love Paradise"), Team, several other dramas. She is also a music idol and has released 4 CDs and 1 album. PGSM. Item. カラオケ・クラオン・パスポート One year entrance pass. 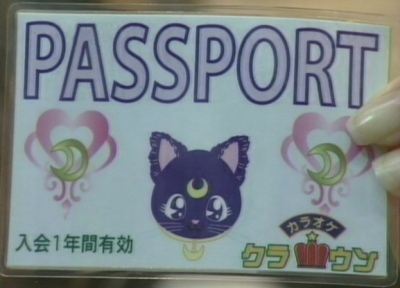 Luna provides a passport to each of the senshi which is used to enter Karaoke Crown. PGSM. Actor. 黄川田将也 (きかわだ まさや) The actor who played Furuhata Motoki. He was born June 1, 1980 in Saitama, Japan. He enjoys music, basketball, and tennis. He has appeared in several movies including Jun, Tomie Re-birth, Twilight Syndrome - Graduation. PGSM. Character. 木野まこと The civilian form of Sailorjupiter. First appeared in Act 5. She appears to be a very tough girl and even beats up several males who had been bothering Usagi. However, Makoto is very sweet and gentle. Motoki, the worker at Crown Karaoke has a crush on her and she gives him a hand-made scarf as a present. PGSM. Actress. 北川景子 (きたがわけいこ) The actress who played Sailormars/Hino Rei in the live action. She was born August 22, 1986 in Hyogo, Japan. She has appeared as a model in several magazines including Japan's Seventeen magazine and Bomb magazine and was one of the Miss Seventeen models in 2003. PGSM. Actress. 小池里奈 (こいけ　りな) The actress who played Sailor Luna in the live action. She was born September 3, 1993 in Tochigiken prefecture, Japan. She has a pet dog and enjoys swimming and piano. She has released an idol DVD and appeared in U-15 Live Version Vol 3 and Pure Pure magazine. PGSM. Actress. 小松彩夏 (こまつ あやか)The actress who played Sailorvenus/Aino Minako in the live action. She was bornJuly 23, 1986 in Iwate, Japan. She enjoys candy making and Japanese dance. She appeared in the movie Bayside Shakedown The Movie 2: Save Rainbow Bridge and the Idle Do TV drama. She has also modeled for several magazines including Candy and released multiple idol DVDs and photobooks.